The sun is up and school is out, and for Spokane residents, there are summer activities aplenty. Here are some top picks that can be enjoyed without emptying your wallet. By now, many people know about the free open and lap swimming at all six Spokane city public pools. To get in, residents need to sign up for a Splash Pass on the city website, or in person at the door. What families might not know is the city offers other free activities at several public pools as well. Free Family Nights at the Pools are pool parties for families and friends. They include swimming, food and a deejay. Families are welcome to bring food and drink – but leave alcohol, barbecue and glass bottles at home. All parties run from 6:30 p.m. to 8 p.m. The events start this month, and no prior registration is required. The parties will be held Friday at the Shadle Aquatic Center, July 6 at Hillyard, July 20 at Liberty, Aug. 3 at A.M. Cannon and Aug. 17 at Comstock. The city will also offer free swim clinics for kids, and a parent-tot swimming class. 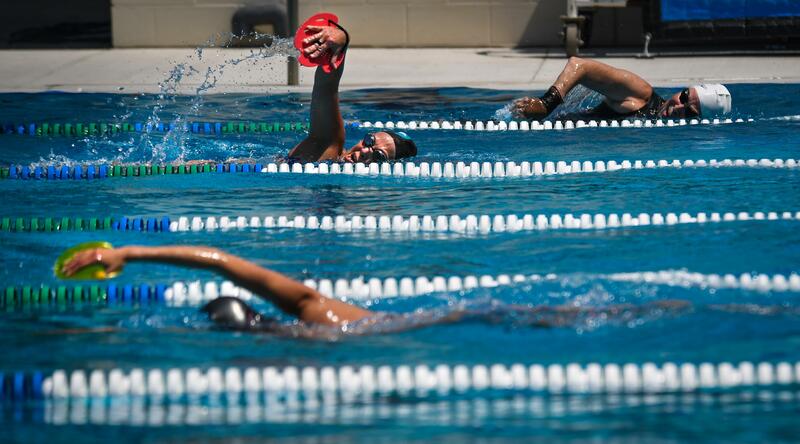 Unlike lessons, the swim clinics are one-day, 30-minute sessions that are free thanks to donations from the Spokane Parks Foundation, said Recreation Supervisor Josh Oakes. Pre-registration is required, and information is available on a webpage for the city’s summer guide. “What we want is just to try and teach kids how to be safe around the water,” he said. Free family yoga classes will be available the last Thursday of the month in Franklin Park from 6 p.m. to 7 p.m. The classes run June 28, July 26 and Aug. 30, and are taught by studio YogaJoy North. There is also a free River Flow Yoga course, hosted in Riverfront Park on the orange Howard Street pedestrian bridge and taught by a professional instructor every Saturday beginning at 9 a.m. through Aug. 18. A range of free activities is presently available every Sunday from 1 p.m. to 3 p.m. at Riverfront Park, including a parkour class, crafts and sidewalk games. Free art classes will be held at Riverfront Park from 1 p.m. to 3 p.m. June 23, July 14 and 28, and Aug. 18 and 28. The event is open to all ages, although parents with young children will need to provide support for art instructors, said program manager Amy Lindsey. “Magical Mondays,” an interactive show for all ages put on by Cecil the Magician, will be performed at Riverfront Park on June 25 at 4 p.m., July 2, 9 and 16 at 4 p.m., and Aug. 6, 13 and 20 at 3 p.m. The event is free. The Chase Gallery in City Hall and Gonzaga’s Jundt Art Museum are both free year-round. The Jundt Museum houses Gonzaga’s permanent collection, as well as some special and temporary exhibitions. It is open 10 a.m. to 4 p.m. Monday through Saturday. The Chase Gallery is open Monday through Friday, 8 a.m. to 5 p.m.
Riverfront Eats, a gathering of live music and food trucks, is held every Tuesday through Aug. 21, from 11 a.m. to 2 p.m. on the south bank of Riverfront Park. The music is free, and a portion of proceeds from the food trucks will go to supporting free and low-cost programming. The Shop on 924 S. Perry St. will host free movies on July 28, and Aug. 4, 11 and 18, with open seating in The Shop parking lot. There will be 7 p.m. movies at Riverfront Park on Wednesday and June 27, July 7, 11, 18 and 25, and Aug. 1. A schedule of upcoming showings is available at the Outdoor Movies at Riverfront Park Facebook page. Admission is $5, and children 5 and under attend for free. For Liberty Lake residents, there are free movies at Pavillion Park scheduled for July and August listed on the Friends of Pavillion Park Facebook page. A recreation and fitness-themed event, Summer Parkways closes off streets for walkers, runners and non-motorized vehicles. It features courses in healthy living and activities including yoga, Zumba, gymnastics, tai chi, fencing, dancing, Pilates, self-defense and martial arts. The event is held this Thursday from 6 p.m. to 9 p.m. The sessions are free of charge. Libraries in the Spokane area are continuing the time-honored tradition of summer reading programs that many readers will remember from their childhood. There are also kid-friendly events hosted at Spokane libraries throughout the area. Spokane County Libraries will host several music events, including family musician Eric Herman, and “The Sound and Music” with Mobius Science. They are hosting a pop-up library from 10 a.m. to 6 p.m. on Sprague Avenue next to Balfour Park on Saturday. Spokane Libraries will also host several arts and crafts projects, movies and kids’ concerts. Full schedules are available on the library websites. Spokane public schools are hosting several camps for pre-K through eighth grade from July 9 to Aug. 2. They aren’t free, but offer a wide range of activities including Lego robotics, coding, 3D printing, stop-motion animation and a STEM art studio. Costs for preschool camps are $45 for each two-day session and $90 for two camps per week. K-8 camps are $90 for one-week camps, and $180 for two-week camps.